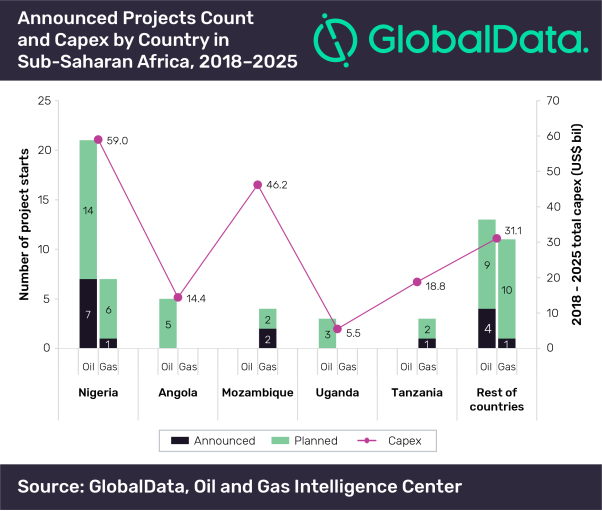 Nigeria accounts for more than 34% of the proposed capital expenditure (capex) on planned and announced crude and natural gas projects in the sub-Saharan Africa over the period 2018–2025, according to GlobalData, a leading data and analytics company. The company's report: ‘H2 2018 Production and Capital Expenditure Outlook for Key Planned Upstream Projects in Sub-Saharan Africa – Royal Dutch Shell Dominates Production and Capex Outlook' reveals that Nigeria leads in the sub-Saharan Africa with a capex of US$59bn on 28 planned and announced projects during the 2018–2025 forecast period. Of the total count, 8 are planned and 20 are announced projects. Among operators, Shell Petroleum Development Company of Nigeria Ltd leads with the highest operatorship of four upcoming projects in the sub-Saharan Africa during the forecast period – three announced and one planned – all being conventional gas projects. Sonangol P&P occupies second place with operatorship of three upcoming oil projects.